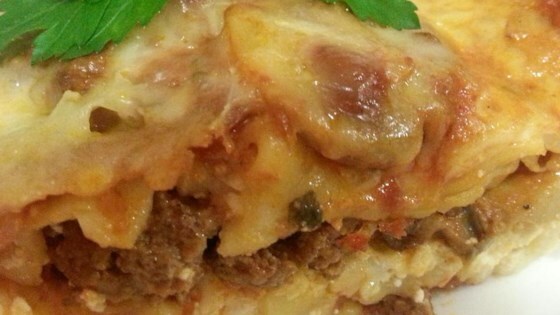 "A super easy and fast beef lasagna recipe. It is made with a prepared sauce, and requires no boiling of the noodles." In a large skillet, cook and stir ground beef until brown. Add mushrooms and onions; saute until onions are transparent. Stir in pasta sauce, and heat through. Spread a thin layer of the meat sauce in the bottom of a 13x9 inch pan. Layer with uncooked lasagna noodles, cheese mixture, mozzarella cheese, and meat sauce. Continue layering until all ingredients are used, reserving 1/2 cup mozzarella. Cover pan with aluminum foil. Bake in preheated oven for 45 minutes. Uncover, and top with remaining half cup of mozzarella cheese. Bake for an additional 15 minutes. Remove from oven, and let stand 10 to 15 minutes before serving. Wonderful and easy! Just make sure you end with meat sauce and not pasta otherwise the top pasta will not cook fully. Served this at a family get-together. Made two of them. Went fast and got a lot of compliments.